Qwerkity is an online retailer of unusual gifts and I think that suits both Chris and my dad down to the ground. I'm not a fan of buying the usual stuff off the high street and I like to put a bit of thought into my gifts and buy them something that I know they'll love. Qwerkity have a fabulous range of gifts for Father's Day so you are sure to find one that your dad will love. If your dad (like Chris) is really into his facial hair looking on point, why not buy a bottle of Beard Oil (£9.99)? It nourishes and conditions the beard and the blend of argan, coconut and almond oil will leave it smooth, soft and glossy. Similarly, you could opt for some Moustache Wax (£9.99) to keep it groomed and tidy with a firm, natural finish. If he's the cook of the house, the Meat Cuts Apron (£17.99) would be perfect and educational too! Does your rugby-crazy dad still take a packed lunch to work? The Gilbert Rugby Lunch Bag (£19.99) is the answer to his prayers. It is an Official Size-5 rugby ball lunch bag, it's insulated and can be wiped clean. If your dad is partial to a beer or two, the Freeze Glass (£17.99) is a genius idea. You keep the glass in the freezer then when you want a drink it keeps it cold for you, even in the hottest weather. It holds 1 pint and even has a rubber grip to prevent your hand from getting cold. Chris is a big bacon-fan and most men (as stereotypical as it sounds) feel the same way. You can buy your dad his very own Bacon Curing Kit (£21.99) so he can make his own in just 7 days, all he needs to do is add the pork belly! Is Dad a keen gardener? The Gardener's Gubbins Pots (£19.99) are great for keeping all of his bits and bobs tidy and together. Each of the little metal pots are labelled so everything can be found quickly. Additionally, you could treat him to a Mini Seed Tray Tamper (£4.99) which makes sowing seeds in cell trays easy peasy. Everyone has their own chair at home, right? Help your dad personalise his with his own Mr Cushion (£19.99). Very cute! 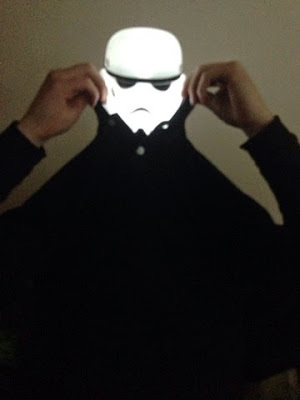 Finally, nerd daddies like Chris will go crazy for the Storm Trooper Mood Light (£14.99). 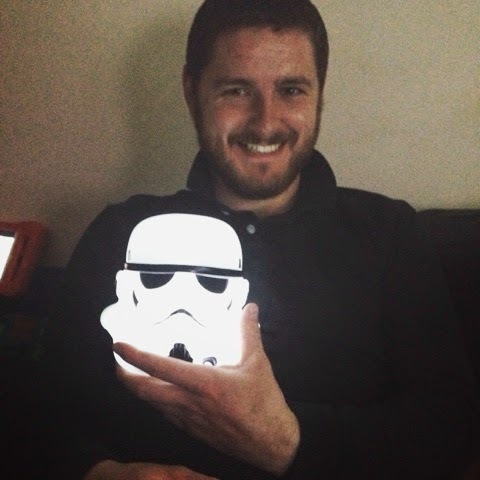 Chris loves Star Wars and he is absolutely over the moon with his. He was like a kid at Christmas opening it. It's battery powered (not included) so no need to use up electricity and it gives off a lovely soft glow. It is a lovely addition to the "mancave". He has spotted that they sell a Darth Vader one too so that will be next on my list to buy! You can find out more at the Qwerkity website or you can follow them on Facebook and Twitter.